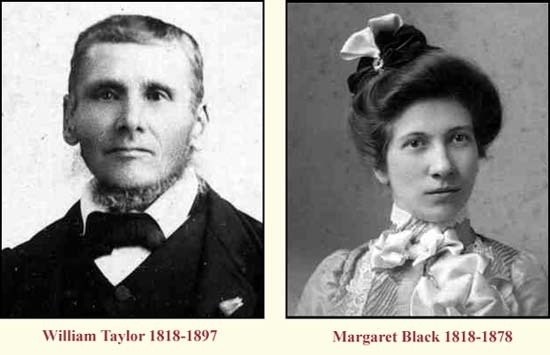 The following is a history, in genealogical format, of the descendants of William TAYLOR and Margaret BLACK . William and Margaret lived in Ellon, Aberdeenshire, Scotland, through the 1840's, 50's and 60s. I have been able to identify seven children, Catherine, William, David, Hellen, John, James and George. Catherine and Hellen immigrated to Canada and apparently some of the boys relocated to London, England. Margaret's BLACK's father was David BLACK and her brother David Jr. was one of the first settlers in the Gore of Greenock along with the LAMB, LEASK and BROCKIE families. In 1877 David Jr. returned to Scotland for a visit and brought his niece, Catherine TAYLOR back to Canada with him. Catherine TAYLOR (1848 - 1934) came to Canada with her uncle Davie BLACK in January 1877 and worked as a domestic for Mr. and Mrs. William BROCKIE on the Base Line of Greenock across the road from the LAMB farm. In October of 1877 she married William LAMB and moved into a log house on the east side of the farm then owned by William's brother Louis. William TAYLOR (1850-1930) married Isabella BROOK on March 29, 1873 in Peterhead, Aberdeenshire. They raised seven children: William, Maggie, John, Robert, George, Isabella and Helen in Peterhead. David TAYLOR (1851-1921) married Annie and they had atleast three children. David and Annie lived in Aberdeenshire. Hellen TAYLOR (1852 - 1929) came to Canada with her uncle Davie BLACK. She married George LAMB in 1885 in Greenock Twp, Bruce County. George was the son of Jane LAMB and a nephew of Helen's sister's husband William LAMB. They had two children, William and Pearl. John TAYLOR (1854-1930) moved to London, England. John and his wife Elizabeth had four children: Maggie, Bill, Daisy and Dorothy. John is buried in Abney Park Cemetery, Stoke Newington, London, England. George TAYLOR (1855-1927) apparently did not marry. James TAYLOR (1859-1926) moved to London, England. He and his wife Catherine Elizabeth Kate had two boys, George and Percy and a girl Alice. James and Kate are buried Sutton Cemetery, Southend-On-Sea. For pictures of this family go to Granny Lamb's Photo Album. The Descendant Journal is a compilation of the descendants of this family, but this genealogy is by no means complete and ultimately I hope to uncover more information about the TAYLOR family mostly those living in the United Kingdom. Meanwhile I would be pleased to hear from all of those reading these pages that recognize errors or omissions or have additional information that could be used to further enhance this family history. Other Ancestral Families connected to Katherine are; RITCHIE; DAVISON/ MORAN; LAMB; BARRON; TAYLOR; BLACK; METCALF/ SIMKIN; TAYLOR; WILSON; KNEESHAW; RUMIG/ REISCH & REID/ McCULLY.